Sunday: Mostly sunny. Highs in the 60s at the coast, 70s inland. Monday: Clouds increase. Highs around 70. High pressure building over New England results in a bit of a split decision Sunday. Near the shore from Cape Cod through Boston and into Portland, Maine, the wind is coming in off of the ocean at 10 to 15 mph with temperatures holding in the 60s, or even falling back into the 50s late in the day. We also may have a fog bank move in before sunset. At the same time in Western New England, where a few spots started off in the 30s, we are warming into the 70s with a good deal of sunshine, mixed with mid and high-level clouds. 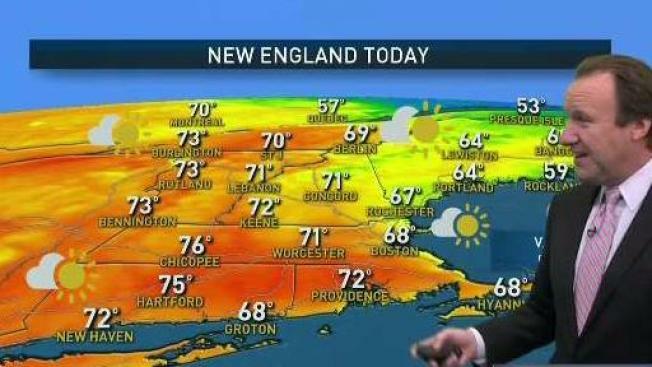 Overall it is a nice Sunday in New England. In Foxborough where the Patriots are set to play a game versus the Atlanta Falcons at 8:30 p.m., the temperature will be falling through the 50s, with near calm air. As high pressure moves off to the east Monday, the return flow from the south and southeast will bring humidity up a bit, along with a little bit more in the way of cloudiness, but it still will not be too bad. Any early fog should burn off, with a high temperature of 70 degrees. We are tracking a storm system that caused five tornadoes in Oklahoma on Saturday. This slow-moving front arrives in New England during the day Tuesday with thicker clouds and showers in western New England. Highs Tuesday will again be near 70 degrees, with the noticeably more humid air. The slow-moving front gets to New England on Wednesday, with periods of rain heavy at times and thunderstorms. Wind from the south may gust past 45 mph especially in the hills and at the shore. High tide late in the day may have some coastal erosion but astronomical tides are not running that strong this week. Rainfall totals may exceed three inches in spots. A drought denting rain seems to be in store, with perhaps even some localized flooding during the day Wednesday. The front edges into Maine on Thursday with cooler and drier air for Western New England. It will stay wet in Maine, but most of us will see brighter weather and cooler air, with high temperature in the 60s east to 50s west. Though an upper-level low is still nearby, it looks like we have brighter weather for Friday and Saturday with sun and clouds mixed, and temperatures more seasonable around 60 degrees. Another energized system will move in later in the weekend, with a chance for more showers and cooler air as we head toward Halloween.